Fresh reports have emerged on why members of the All Progressives Congress, APC, beat up the Archbishop of Owerri Catholic archdiocese, Valentine Obinna on Saturday. Report emerged at the weekend that APC members who accompanied wife of the state governor, Nkechi Okorocha ; chief of staff to the governor, Uche Nwosu; Speaker of the state House of Assembly, Acho Ihim; and some commissioners had allegedly invaded the altar and ordered the archbishop to stop his speech, which they considered to be anti- state government. The incident was said to have happened on Saturday at Saint Michael’s Catholic Church, Ngwoma-Obube in the Owerri North Local Government Area during a requiem mass in honour of the mother of one Alex Mbata. The chief Judge of the state, Pascal Nnadi; and the senator representing Imo East, Samuel Anyanwu, were also present at the church service which ended in a fiasco. A source at the church service, Wilson Okeke , told Punch that the APC members accused the Archbishop of allowing someone to campaign for the People’s Democratic Party during a speech, while he allegedly refused an APC member who wanted to do the same. “The archbishop was not the one who celebrated the mass. It was the parish priest. “The archbishop was only making a speech at the end of the mass , just before the benediction . It was at this point that the assault happened. A People’s Democratic Party member, Iyke Ehiriwe, at some point, according to Okeke, asked to be allowed to speak. 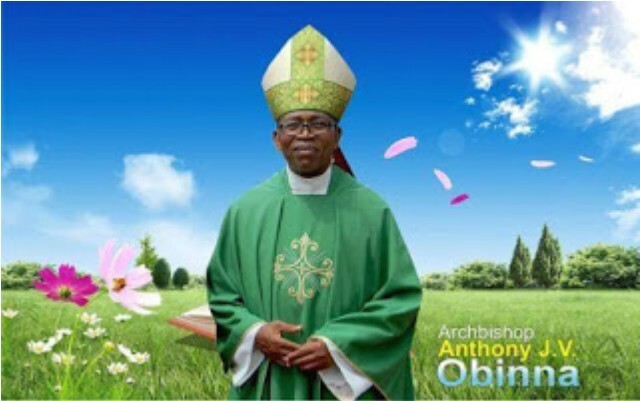 “Initially, the archbishop refused to hand over the microphone to him; but when he whispered into his ear , the archbishop obliged him,” Okeke said. “APC members who came with the government functionaries invaded the altar and asked to be allowed to speak, but the prelate allegedly refused.